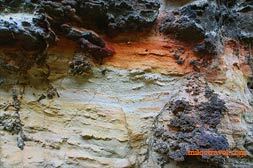 The geological nature of the archipelago is the main reason for its fabulous variety of colors and landscapes. 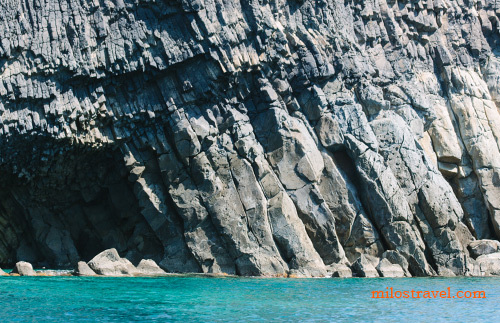 Milos and the nearby islands belong to an important volcano's alignment called 'Aegean Volcanic Arc' formed by the subduction of the African plate under the Aegean area. This arc goes from the golf of Korinthos to the west cost of Turkey. The main volcanic districts are represented by: Methana-Poros, Milos, Nysiros and Santorini , this latter being the only one showing a remarkable volcanic activity over known history. The Milos volcanic district is a wide volcanic archipelago comprising the islands of Milos, Kimolos, Antimilos and Poliegos. From the geological point of view, here the volcanic activity started about 5 millions of years ago and it is now considered extinct. 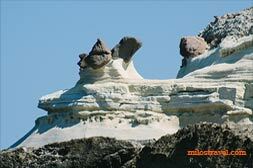 Sarakiniko and Mitakas are the result of the rhyolitic volcanism. Milos’ miners have exploited the obsidian since Neolithic age (7000 years ago). In most of the Mediterranean countries, one may find obsidian that came from Milos. 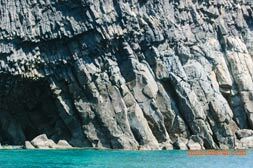 The andesitic rocks, usually dark in color, outcrop in the area of Fylakopì and Pollonia and in the Southwest portion of Milos. It is possible recognize both lava domes and dike set with spectacular columnar jointing originated during the thermal cooling of the lava bodies (Glaronissia, Kalogero). Following their emplacement, volcanic rocks were involved by an intense hydrothermal activity. This kind of physical-chemical process is responsible of remarkable changes in the chemical composition of the original rocks, with the formation of huge ore deposit of clay minerals. Their exploitation represents a considerable source in the Milos economy. 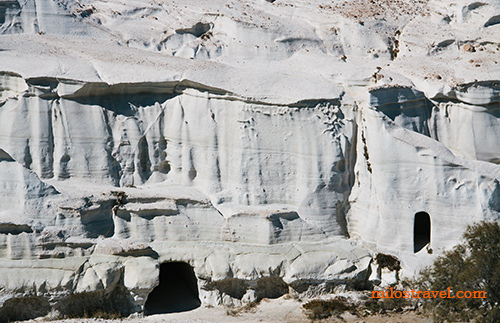 During the 80's Greece was the 2nd world producer in bentonite, a valuable variety of clay deposit. 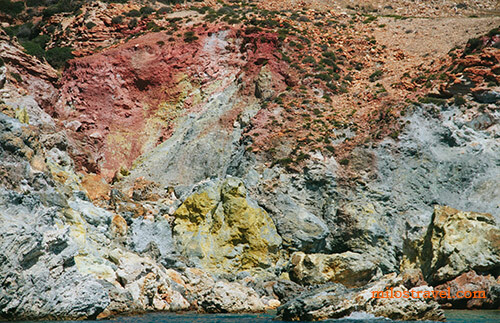 This post-volcanic alteration increases the extreme variety of color and landscape of Milos Island (beaches of Fyriplaka, Fyropotamos and Plathiena). 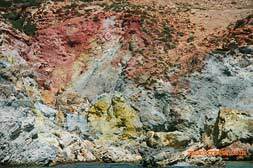 The volcanic nature of Milos is responsible for an anomalous heat flux in the earth crust. In geology, these areas, called 'geothermal fields', could be exploited to produce energy. Unfortunately or not, this favorable geological situation of Milos has not been utilized yet. In the areas of Katifora (above Adamas) and of Zephiria you may see closed wells and the remains of pipelines. In the 80’s international companies initiated a project to exploit geothermal fields but, after the blast of one of the wells, the Milos population decided to reject exploiting projects that would somehow endanger their lives. The same happened with the exploitation of gold in the area of Profitis Elias. Lovers of geology may visit the interesting ‘Mining Museum of Milos”, located in Adamas, a tribute to all Milos miners over the island’s history. Very fine crystalline extrusive rock of volcanic origin composed largely of plagioclase crystals with smaller amounts of ferromagnesian minerals. Parallel, prismatic columns that are formed as a result of contraction during cooling in lava bodies like domes, lava flow and dikes. 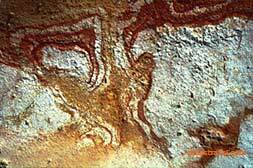 A tabular body of igneous or lava rock that cuts across adjacent rocks or cuts massive rock. Volcanic activity characterized by magma explosiveness. It is the result of the violent expansion of magmatic gases within the rising magma because of the decrease of confining pressure. A hole, usually found in volcanic areas, from which vapors or gases escape. A schistose metamorphic rock with abundant crystals of chlorite and epidote, giving it a green color. Movement of the heat from the earth interior to the surface. Circulation of hot, residual watery fluids derived from magmas during the stages of their crystallization and containing large amounts of dissolved metals, which are deposited as ore in fissures along which the solutions often move. The rock mass formed by consolidation of molten rock issuing from volcanic vents and fissures. 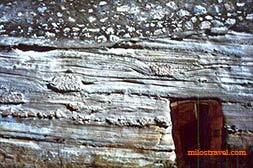 A large igneous or lava intrusion whose surface is convex upward. 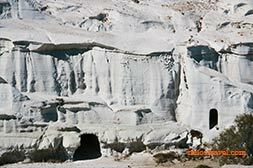 A rock formed from preexisting solid rocks by mineralogical, structural, and chemical changes, in response to extreme changes in temperature, pressure, and shearing stress. A jet-black volcanic glass, usually of rhyolitic composition, formed by rapid cooling of viscous lava. 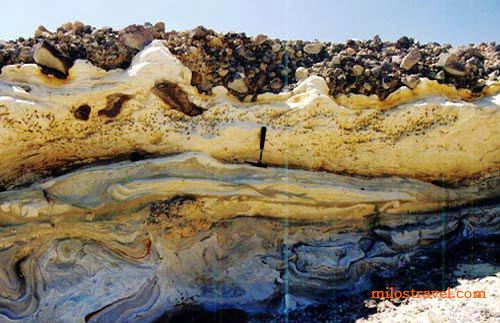 A rock froth, formed by the extreme puffing up of liquid lava by expanding gases liberated from solution in the lava prior to and during the solidification. A rock that is composed of fragmented volcanic products ejected from volcanoes in explosive events. A light-colored, aphanitic volcanic rock composed largely of alkali feldspar crystals and free silica with minor amounts of ferromagnesian minerals. 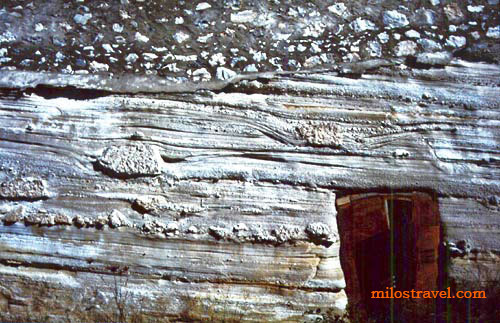 A rock formed by consolidated sediment deposited in layer. The process by which one crustal block descends beneath another, such as descent of the Pacific plate beneath the Andean plate along the Andean Trench. Finely crystalline or glassy igneous rock resulting from volcanic activity at or near the surface of the earth. "No matter where you live on Earth, each time you cook, eat, drink, wash, and write, paint and travel, there is a very high probability that you will be using materials from Milos. 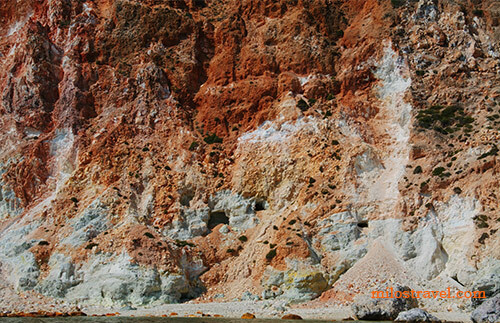 Milos has been providing these basic commodities for civilization for thousands of years and it will continue to be a major world supplier of bentonite, kaolinite, perlite and pozzuolana - rare materials from the Earth, which we all use every day in our lives. If Milos does not provide such materials, then geology tells us that there are no other places in our Solar system that can".